The Bryder Chiropractic Clinic environment is warm and professional, with an open, spacious setting that will make you feel welcome from the moment you arrive. You can fill out the necessary intake forms by downloading them from our website. Then, we’ll promptly get started with your visit shortly after you walk in. While scheduling your new patient appointment please be prepared to give us your credit card information to have on file. We realize that emergencies and other scheduling conflicts arise and are sometimes unavoidable. However, advance notice allows us to fulfill other patient’s scheduling needs and keeps the clinic operating at is most efficient level. Due to our new patient appointments being in high demand, missed appointments are a significant inconvenience to other patients that need our help and our care. This policy is in place out of respect for our doctors, team, AND our patients. Cancellations with less than 24 hours notice are very difficult to fill. By giving last minute notice or no notice at all, you prevent someone else from being able to schedule into that time and receive the care they need. This policy applies to ALL initial visits including massage. You’ll meet Dr. Bryder and sit down for a consultation to determine if you’re a candidate for chiropractic care. If so, we’ll get started on an examination that involves chiropractic testing and X-rays, if needed. While your X-rays develop, we’ll do a form of therapy, such as moist heat, to start your healing. 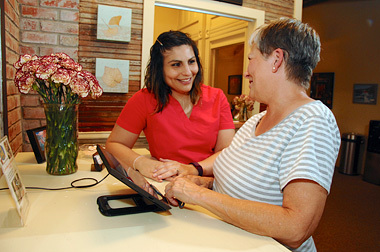 You’ll receive an adjustment and schedule back for a return visit. Your second appointment involves Dr. Bryder detailing all the findings from your first visit. You’ll also get an explanation of his recommended care plan. Any therapies needed are given, and you’ll receive another adjustment. Subsequent appointments take 20-30 minutes. You’ll come in and get started on any necessary therapies, then receive an adjustment. We respect your time and do everything possible to make your visits thorough, yet efficient. Chiropractic care is a powerful tool you can use to stay well. We encourage you to value your health and consider being under care in the long term.